A few days ago I wrote about Douglas Bowman’s implementation of Adaptive Path, focusing mainly on the design and CSS aspects of the site. 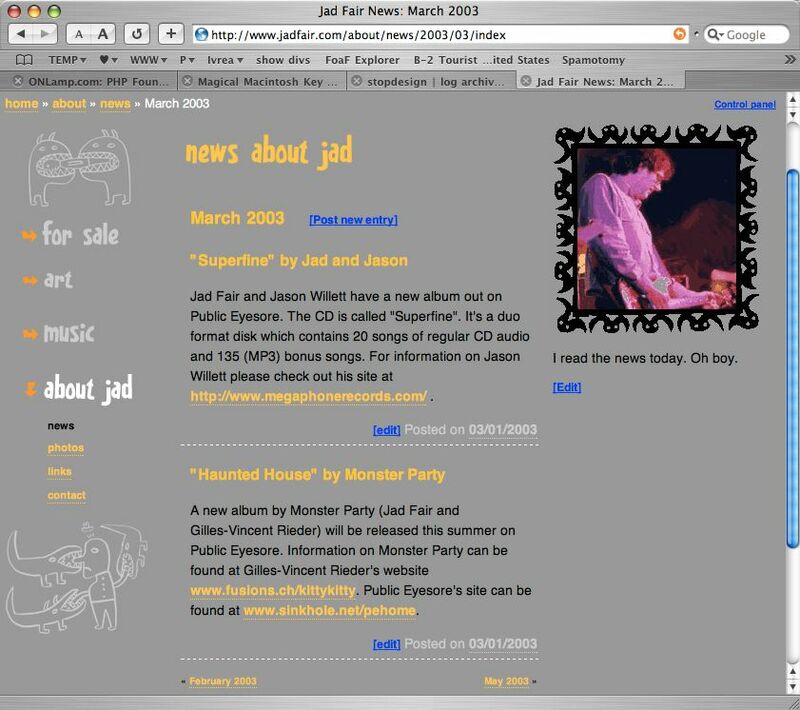 Interestingly enough it is also a Movable Type powered site and the person who coded that part of it, Jay Allen, has shared a number of the secrets he used on that site and another of his work, Jad Fair. Read Adaptive Path’s MT Setup and pay particular attention to Jay’s follow-ups in the comments. * Everything is dynamic and controlled from within MT. To make it easier for the owners of the sites he built a “gateway” page, or simple admin screen, that can be used to control all of it. Here is an example from the Jad Fair site. * Even simpler than a gateway page, Jay has enabled editing links that appear when the site owner is logged into his site. This is a built-in feature of MT that anyone using the standard templates can see when using the stock search template. But I don’t think any of the standard templates show them being used on the main page and because of that I think most MT users have no idea the functionality exists. I think it’s a critical piece of functionality when talking about building a site for people who shouldn’t have to know the underpinnings of the site. For example, using MT to power an internal site where there is a letter from the CEO or something on the main page. Rather than going through a bunch of rigmarole to get that letter updated you simply setup the CEO with authoring rights (I suppose you may have to setup that section as a separate weblog so other authors don’t have authority. I think more granular security is a future MT Pro feature) and when he/she wants to change the letter they just go to the same main page, click the edit link that only they see, and make the change. Bingo – timely, easy updates. Weblogs and MT in particular are really starting to get attention as low cost content management systems. About.com is now using MT, which is a major site with hundreds of authors providing updated content. In these days of tight budgets and shrinking staffs the ability to do more with less is critical. Projects are getting smaller and departmentalized and the pressure is on to find solutions on the cheap. Movable Type fills that niche. About.com and Jay Allen’s work on Adaptive Path and Jad Fair are great examples of a future that empowers non-technical content creators to deliver fresh and timely content to their readers at a price that any CFO would love. 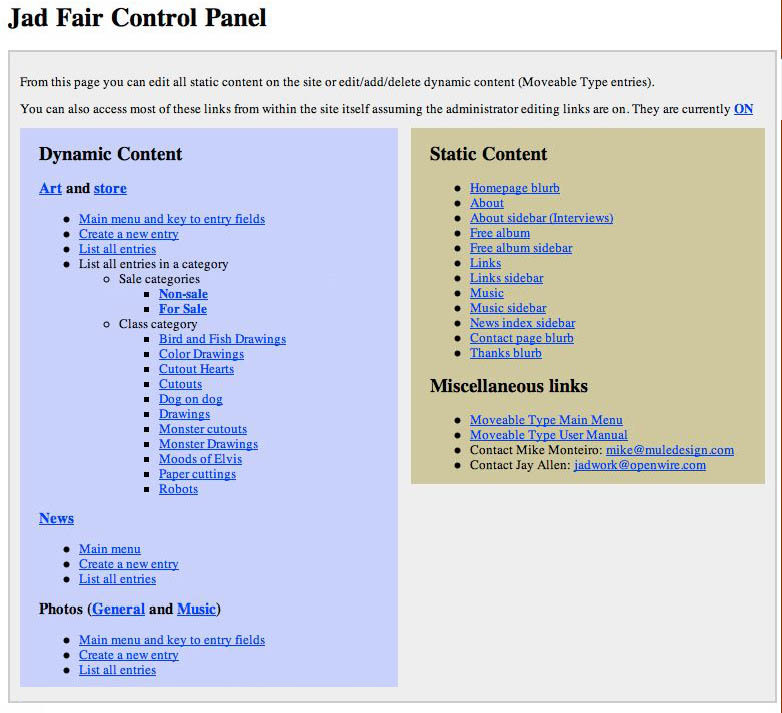 So we can learn from there methodology of decentralizing blog adminstration. YMDI’s command center will look something like this….